Well, it wasn't an easy decision, but I finally made my choice. Over the last two days I've been on and off the phone with my recruiter doing some last minute paperwork and getting all my stuff in order. After today, things are going to proceed pretty fast. They are sending me my bus ticket tomorrow and I will be in Missouri by Sunday. I just can't wait - getting that adventurous feeling again. I didn't choose any of these, but it wasn't because I didn't think they would be good to work for - I just had a different company who kept after me and I liked their offers and persistence. But those companies are definitely hiring, and they are good leads to follow if you are just getting started. Remember, talk to all of them and more. See which one is best for you. As far as myself, I got my lease signed over to my sister, my bills are in order, I have my bag packed, and now...I wait. Once I get to Missouri, I will have a four day orientation, after which I get my permit; then, from what I gather, I go out and get some one-on-one with an instructor for about 3-4 weeks. Then I come back and obtain my CDL. After that, I go out and drive with a trainer for about three months, after which my training will be complete. Then I go out solo and continue my learning experience on my own. Very excited! 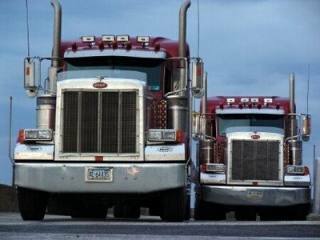 I have been studying constantly and urge those thinking of becoming a trucker to do the same. I have a training book from my local DMV. I've gone over it more than a few times. Then, I will go and take the CDL practice exams TruckingTruth has here. It helps to be prepared. OK, next time I talk with you folks, my orientation will be complete and I will be behind the wheel learning the basics, God help you all.